Like many Americans, I grew up eating seedless, thin-skinned grapes. 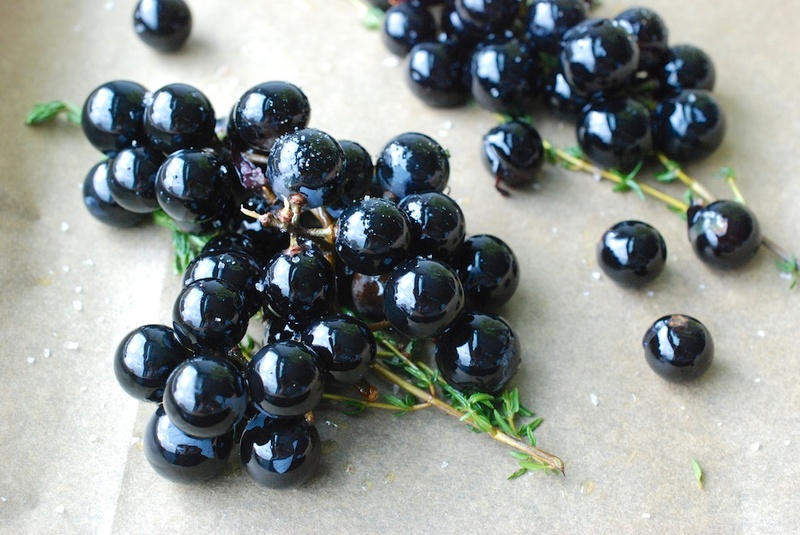 It wasn’t until I visited the Frenchman’s family that I tasted my first sour grape, small and green as a jade bead, thoroughly packed with bitter seeds. Neither variety left me particularly inspired. And then, and then. 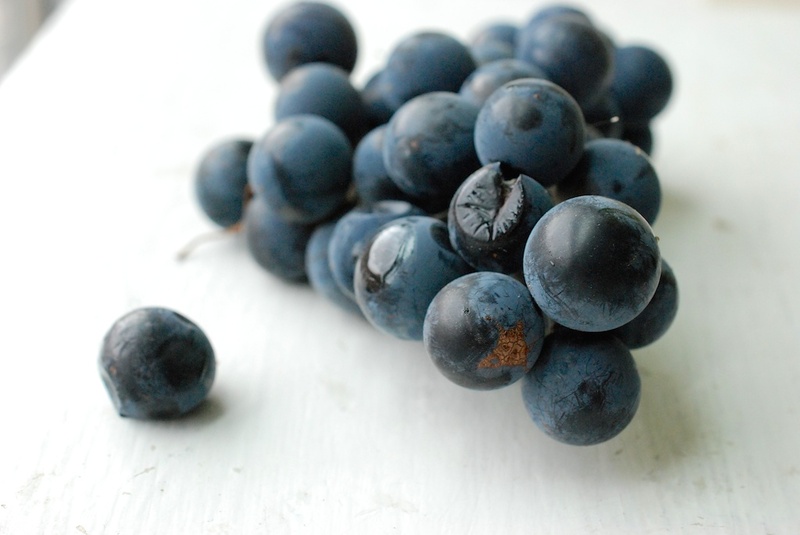 I received a punnet of Concord grapes in my CSA basket this week. Holy milkshakes. Are these ever game-changing grapes. First of all, they are very nice to look at: inky in shades of dusty, Prussian blue, their skins lightly variegated like crushed velvet. But what really gets me is how they smell. There is no other way to say it–they smell like candy. They smell like grape Jolly Ranchers in perfume form. My apartment is small. When I lay them on the kitchen table, I can smell them from almost every corner. I feel like some kind of crazed addict, pulling long, conspicuous sniffs as I go about my writing. 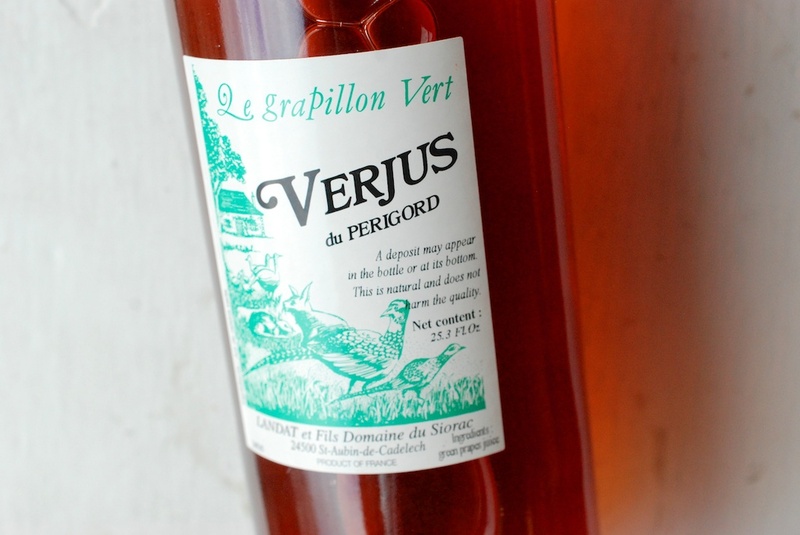 The arrival of these grapes dovetailed nicely with a recent purchase, a tall bottle of verjus. (Verjus is pressed juice from unripened grapes. It tastes less harsh than vinegar, but it’s still more tart than it is sweet.) Verjus is hard to locate outside a specialty store, so I was a wee bit excited when I came across some. I decided that duck breasts would be a satisfying vehicle for my Concord grapes and the verjus. The resulting recipe is quite simple, although it looks and tastes of far more labor than it is. Any leftovers could happily find their way into a cold sandwich the next day. 2. Rinse the grapes and dry them well. Toss them gently with the olive oil, some sea salt and pepper, and the thyme sprigs. 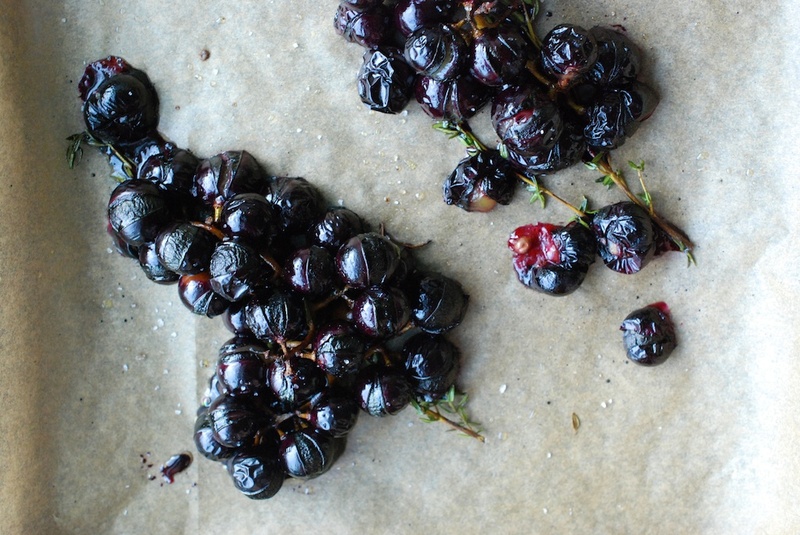 Lay the grapes and the thyme on a parchment paper-lined baking sheet. 3. When the oven is hot, move the baking sheet into the oven. 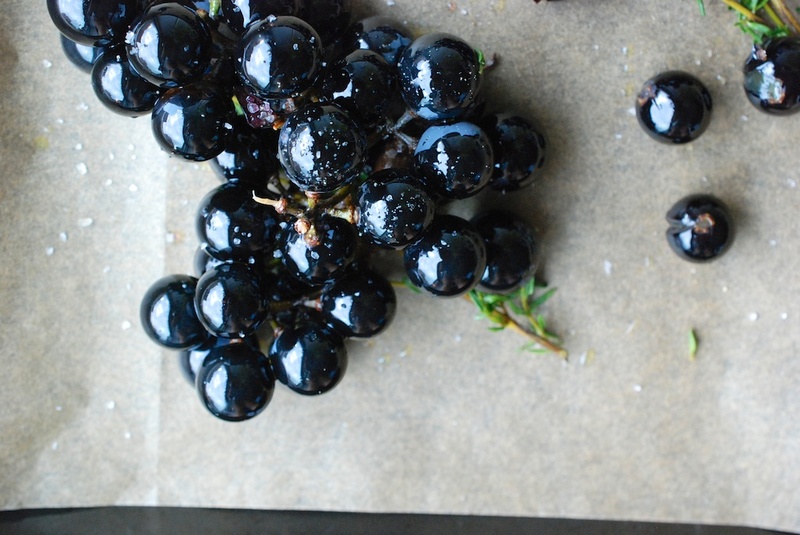 Cook the grapes for 10-15 minutes, or until they split and start to release their juices. 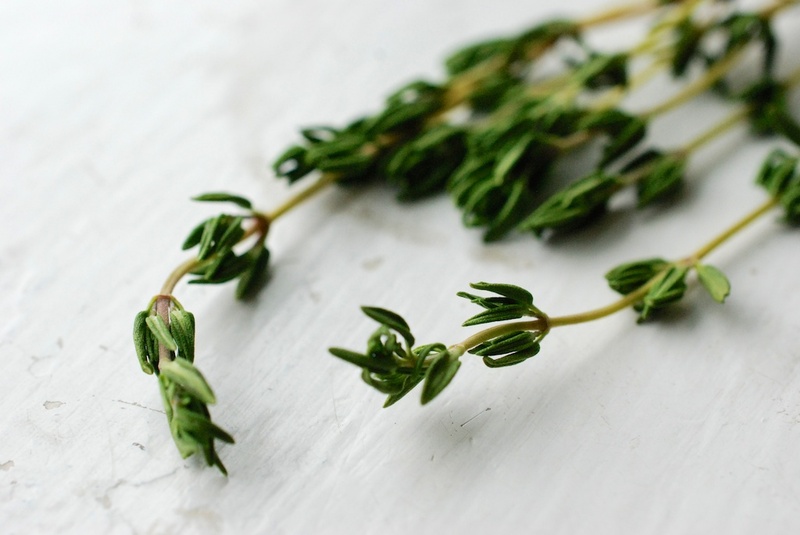 Run the grapes and the thyme through a fine mesh sieve; discard the skins, seeds, and the thyme sprigs. You should be left with a thick-ish grape juice. Set the juice aside. 4. Meanwhile, pat the duck breasts dry. If the fat is very thick, you can cut some away to thin it. (Save this fat, and render it for later use on potatoes, vegetables, whatever you like.) 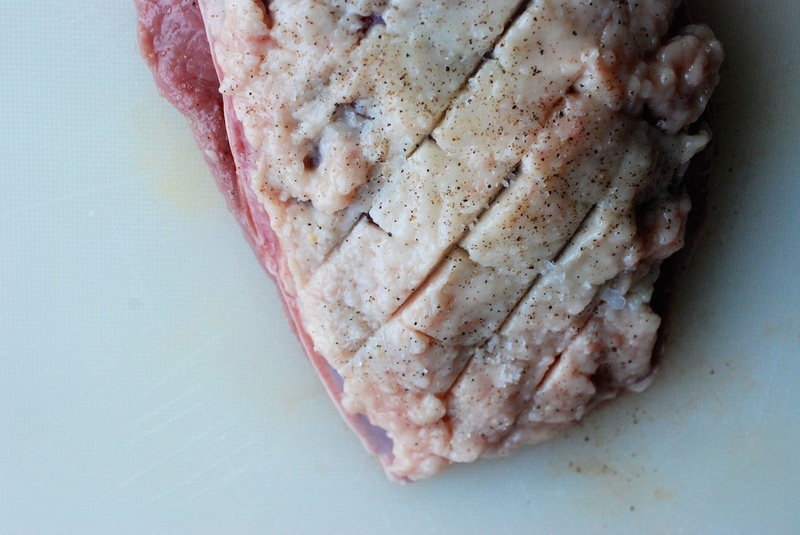 Cut a diamond pattern into the fat, making sure not to penetrate the meat. Generously salt and pepper both sides of the duck. 5. Heat a pan (cast iron, if you have one) over medium heat. When the pan is plenty hot, add the duck breasts, fat side down. Let the fat sizzle and crisp, about 5 minutes. When the fat side is golden brown, flip the breasts and cook for another 3 minutes. If more than 1 tablespoon of fat has collected in the pan, pour some of it off. 6. Move the duck pan to the oven. Cooking time will depend on the thickness of the breasts, but start with 8 minutes. You are looking for 125F-130F on a meat thermometer. 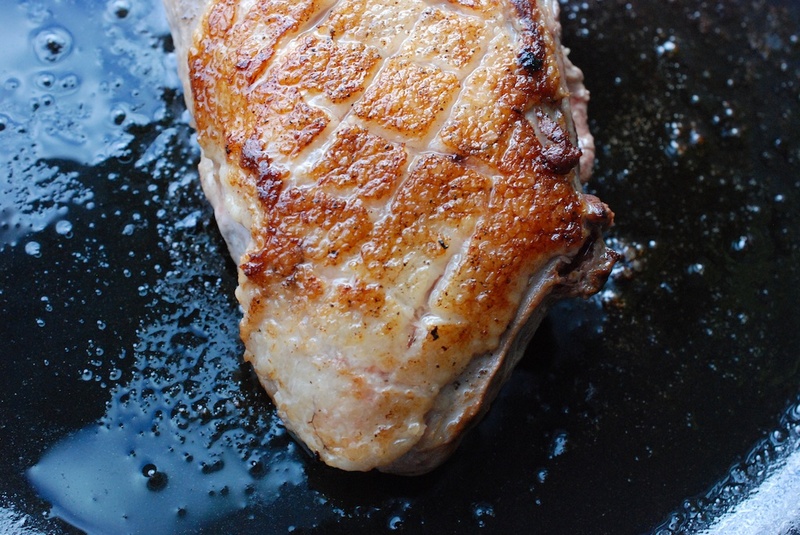 When the duck is cooked, remove it from the oven and lay it on a cutting board. Cover the duck with foil, and let it rest for 10 minutes. 7. Move the pan back to the stove top and turn the heat to medium-high. Add the verjus and the chicken stock. Stir to scrape the brown bits off the bottom of the pan. Let the liquid boil away happily for about 5 minutes, or until you are left with a mere 2 tablespoons. At this point, lower the heat to medium-low. 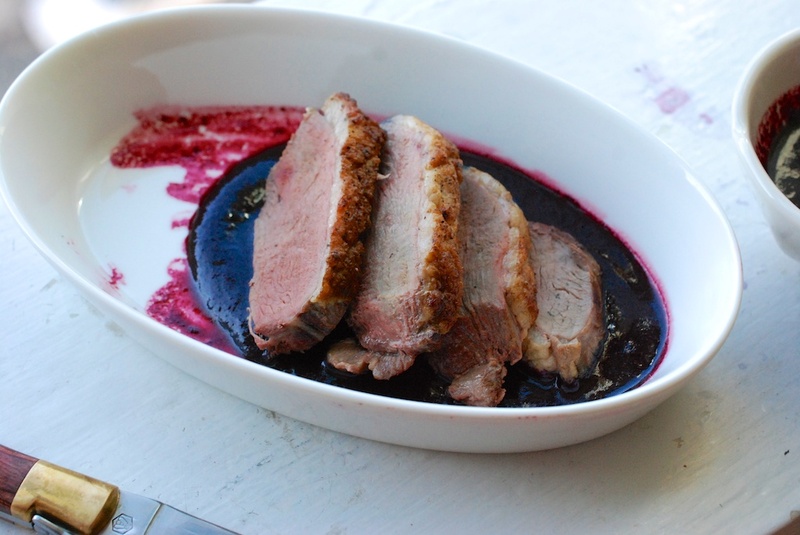 Add the reserved grape juice, as well as any juice that’s accumulated under the resting duck. Let the sauce cook and come together, about 2-3 minutes. Adjust the seasoning as necessary. 8. 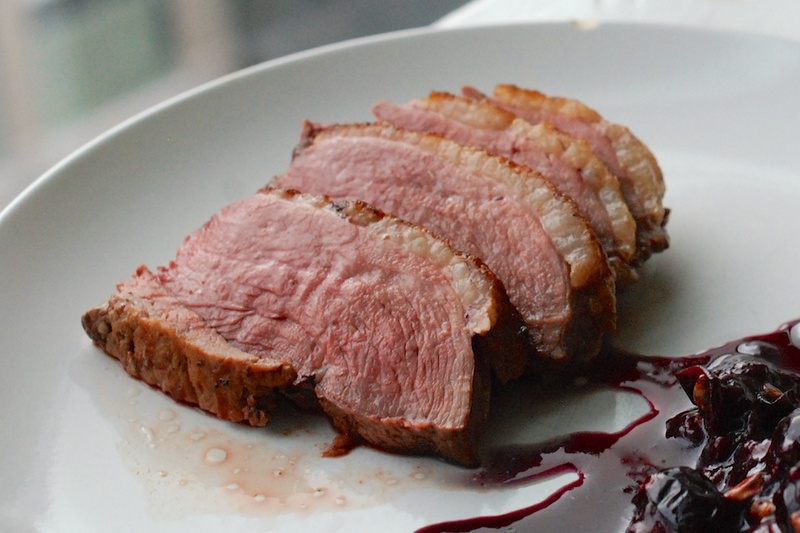 Cut the duck breasts into slices and arrange on plates. 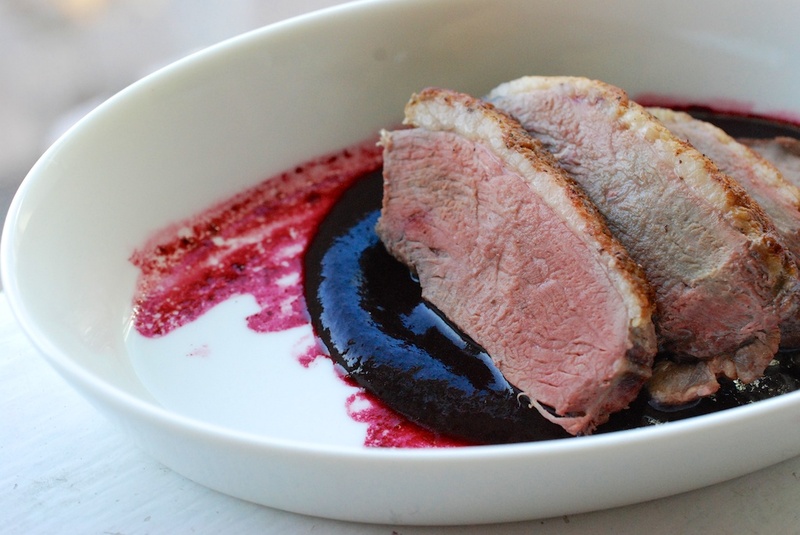 Dress the duck with the Concord sauce. Serve with boiled potatoes. My dearest Holy Milkshakes, could you imagine satiating that hunger one night next week (Tuesday-Thursday)at the new Japanese place near my piso? The Frenchman will be in Seattle.